When this news post hits 88 miles per hour, you're going to see some serious trailers. Finally, a chance to write about something this week that isn’t prefaced with the word “Steam.” Welcome to Steam Missing Pieces, where we wrap up the Steam Week’s best Steam Gaming news. Rocket League’s going Back to the Future, Fallout 4 gets a live-action trailer, The Witcher 3 sends the taxman after players, and Jeff Goldblum uh, uh, finds a uh way into Call of Duty—this is gaming news for the week of October 12-16. Valve’s putting on another free weekend and this time it’s for the pretty-damn-good RTS Grey Goo, released earlier this year. As always, look for Grey Goo in your Steam library. You can install and play from now until Sunday afternoon, at which point the files will turn to grey goo on your hard drive. The game's on sale for 60 percent off, too. Rocket League a.k.a. soccer with cars a.k.a. the best sports video game ever made gets possibly even better next week when Back to the Future DLC hits. For $2 you can play Rocket League in a DeLorean. The tires fold up and you can unlock flaming tread marks as a rocket trail. So...get ready to see pretty much everyone playing as DeLoreans after October 21. A bit of alpha/beta business this week. First, and likely most important, is Blizzard’s team-based shooter Overwatch. The closed beta will start up on October 27, so make sure to opt-in through Battle.net if you haven’t already. And Battleborn, the similarly team-based shooter from Gearbox, will go into a “closed technical test” on October 29, and you can sign up here. Or if you’re more into gibs, the Doom alpha is taking sign-ups—though you’ll need to have preordered Wolfenstein: The New Order and redeemed your code to have a shot at participating...whenever it launches. Good news for people who don’t want to hear a 12-year-old say he fornicated with their mother—DICE confirmed Star Wars Battlefront will not feature in-game voice chat. Which I guess is bad news for anyone who hoped for some semblance of tactics in a random pub game. Something I can get behind though: DICE rebalancing the Walker Assault mode. A beta that actually served as a beta! In 2015! Bethesda continues its streak of “convincing me to share marketing footage” this week with a gorgeous live-action trailer. Which is particularly ironic after the firestorm about Fallout 4’s actual graphics, a few months ago. Speaking of trailers, Avalanche is crowd-sourcing the launch trailer for Just Cause 3. You—yes, you—can download a bunch of footage from the official website, edit it together, and hopefully impress...whoever judges these sorts of things. Win, and you’ll get a high-end PC rig, a copy of Just Cause 3, and a bunch of other random stuff. Like a guitar? For some reason? I rather enjoyed that budget stealth game Styx: Master of Shadows last year, and not solely because it served as an outlet for an endless number of Renegade/Come Sail Away/Blue Collar Man/Mr. Roboto puns. It had its issues, but won me over with its solidly old-school ways. 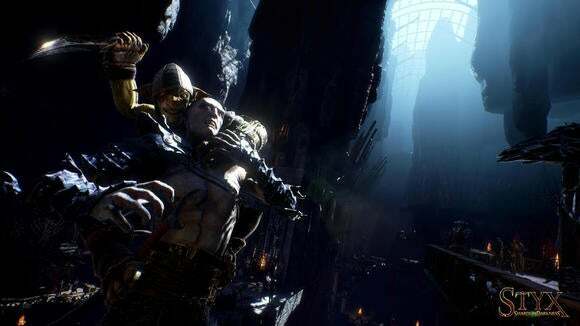 So I’m excited to hear the game’s getting a (hopefully more polished) sequel sometime in 2016, known as Styx: Shards of Darkness. Domo arigato, Focus/Cyanide. It feels like we’ve been waiting forever for the Xbox One’s wireless dongle, but Microsoft has confirmed it’ll finally go on sale next week—October 20, to be exact. Remember: It’s Windows 10 only, for some completely asinine reason. Don’t bother buying it for your Windows 7/8 machine until community-built drivers are available. Want to watch some A-list actors say silly things in video games? Then this is your week. Let’s see, what’ve we got...oh, how about strangely-young Gary Oldman in Star Citizen? Or uh, uh...what about a mustachioed Jeff “Finds a Way” Goldblum murdering his wife for Call of Duty: Black Ops III’s Zombies mode (alongside Heather Graham, Neal McDonough, and Ron Perlman)? The above video (courtesy of YouTube channel WhatsMyGame) shows off an encounter in the new Hearts of Stone expansion. If you took advantage of a few limitless money exploits, the tax collector will show up and try to get the government’s due. Geralt being Geralt, you can of course just lie your way out of the fine. Today’s the unofficial Steam Machine early-emergence day, and we’ve got you covered: Our first week in Steam’s living room, plus in-depth articles about the Steam Link, Alienware’s Steam Machine, and the Steam Controller. Speaking of that last one, Valve’s hoping you’ll mod the Steam Controller and make it better. Aaaand Valve’s promised to keep ads off Steam. I mean, aside from game ads which are literally 100 percent of Steam. But no Doritos. Wasteland 2 received a much-needed facelift this week. Nvidia’s concocted a nefarious plan to lock Game Ready drivers behind GeForce Experience registration. Rounding out the week, that new Transformers game is a special kind of dumb fun.